Last night, I went to a restaurant to eat good food, mostly plants, not too much, with Michael Pollan. We weren't at the same table. Rather, the restaurant Lark was turned over on Valentine's Day into a two-seating, super-special book event, organized by my officemate Kim Ricketts, who runs a book events business that includes regular Cooks & Books events with folks who are chefs or focused on food, like Pollan. He was there to promote his manifesto, In Defense of Food. Pollan is a journalist and a writer whose prose I admire and would like to be able to emulate. The Botany of Desire and The Omnivore's Dilemma are two terrifically readable books with great underlying themes, never too heavy-handed. In Defense is definitely a polemic, however. Lynn and I have been to Lark before, and had a great meal last time. Last night, we had wine paired with each course, which included nearly all local food, including farro (a wheat berry) prepared beautifully with foraged local mushrooms. The restaurant's chef spoke briefly at the onset, then Pollan said a few words about good food and why he's trying to help lead a kind of movement to eat well, locally, and less intensively as a kind of new approach to health that's rooted in the best parts of food and eating before the 1900s and commercial-scale agriculture. He noted, ironically, that being on the road for 5 or 6 weeks to promote the book so far means that he's eaten horribly at every meal. At Lark, he had one of the few traveling meals that met the standards of his book! Pollan stopped by each of the 20 or so tables for a few minutes to chat and sign books, and he's a cussedly nice man, even after spending hundreds of hours talking about his stuff, and signing thousands of books. (He signed 850 at Powell's just for them to sell to all comers; smart man.) I told him how my dad and I had switched from various forms of vegetarianism (I was really a fish-a-tarian at that point) after reading Omnivore's Dilemma; he said he'd heard a lot of that, but also the reverse. 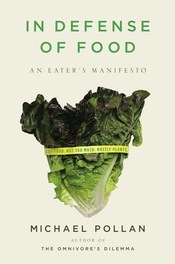 Some omnivores, reading the first half of the book about conventional food, which is terribly frightening, became vegetarians! The Cooks & Books events--which sell out quick, so you can sign up at Kim's site to be notified when they are announced--pair a signed copy of the book by the author or chef, a terrific prix fixe meal typically with wine, and convivial communal seating. We were at a table of about 10, and found a close, late friend in common among my wife, me, and the fellow sitting next to me; talked about the history of agriculture; compared notes about favorite joints in the U District; and talked about nursing, the profession not the mothering kind, as one of our number was a nurse who just started at the big trauma/low-income hospital in Seattle.